Inane. Stupid. And me, I kept slugging through it hoping for redemption. I laugh easily, and am not ungenerous where humor is concerned; yet this book had me frowning in concentration, struggling to complete the darned book. This is an example of "the funniest, most frightening, and most truly bizarre stories" per the back-cover blurb? I've heard more interesting walking-in-on-a-private-moment stories from Bea Arthur. And inserting a sanitary napkin? Poor Miss Atkins indeed. That would be quite painful. Mr. Schrieber, a sanitary napkin is not inserted. Any woman would know this; I wonder did you have no female friends who could read this book and point out your gaffe? This guy must walk around with spinach in his teth, too,if his friends are so stingy with criticism. There is a 2-page list of acknowledgements at the end of the book, did none of these people notice this book's flaws, and mention them to the author? 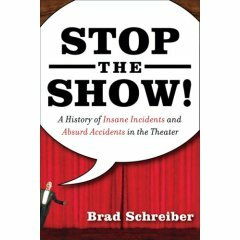 Lest you think I am overly harsh, the author also includes distinctly unfunny episodes in theatrical history such as the historical Iriquois Theatre fire (p 75) and the 2002 Moscow Theatre disaster (p 115). These incidents, at the least, seem out of place in a book about "improvised lines; accidental pratfalls; falling scenery...." as listed on the blurb. Is this guy related to Avery Schreiber? I like Avery's work, especially his Second City material. This author, OTOH, took an excellent idea - that often the behind-the-scenes actions in a play are as interesting as what happens on stage - and developed the idea so poorly that it became a tedious read.